Help Advocate Sudershani Ray know your legal issue better. Get Advocate Sudershani Ray details by SMS and Email. 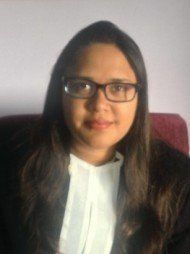 Advocate Sudershani has since been practicing and handling cases independently with a result oriented approach, both professionally and ethically and has now acquired 8 years of professional experience in providing legal consultancy and advisory services. She has completed her BA.LLB(Hons) from Jamia Millia Islamia and has been practicing and handling cases independently and provides legal consultancy and advisory services. Advocate Sudershani provides services in various field of civil as well as corporate laws, inter-alia, Suits, Writs, Petitions, Appeals, Revisions, Complaints relating to debt recovery, dishonor of cheques, rent control act, property disputes, matrimonial disputes, consumer complaints, complaints pertaining to Food Adulteration Act and service matter . In addition to this she is skilled in drafting and vetting various kinds of agreement such as Master Service Agreement, Service Agreement, Teaming Agreement, Consortium Agreement, various Tripartite Agreement, RFQs, Letter of Intent, MOU, Agreement with Celebrity, Endorsement Agreement, License Agreement, Sub-Licensing Agreement, Sub-Contracting, Third Party Agreement, Sale Deed, Corporate Lease Agreement, Development Agreement(Real estate), broadcasting agreement. Advocate Ray enrolled with the Bar Council of Delhi in 2008. She is also a member of the Delhi Bar Council. Questions Answered by Advocate Sudershani Ray Documents are required for settlement of deceased wife bank accounts Is probate of will necessary to enter my name in property card?